Yes, the garden is going to the dogs, literally. We are dog sitting for my Sister's dogs, Sonny and Cher. The ever present Annie keeps an eye on the little rascals. One never knows where they might get off to and what they might do in the garden. 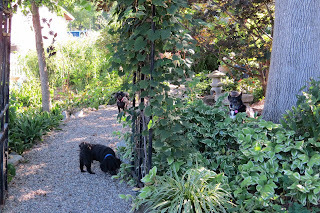 They like to go up and down and around the paths in the garden. 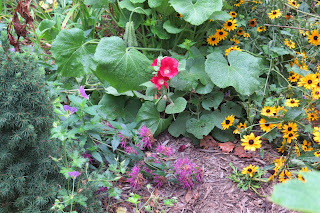 Not a whole lot blooming in the garden right now but if you look around there are spots of color. 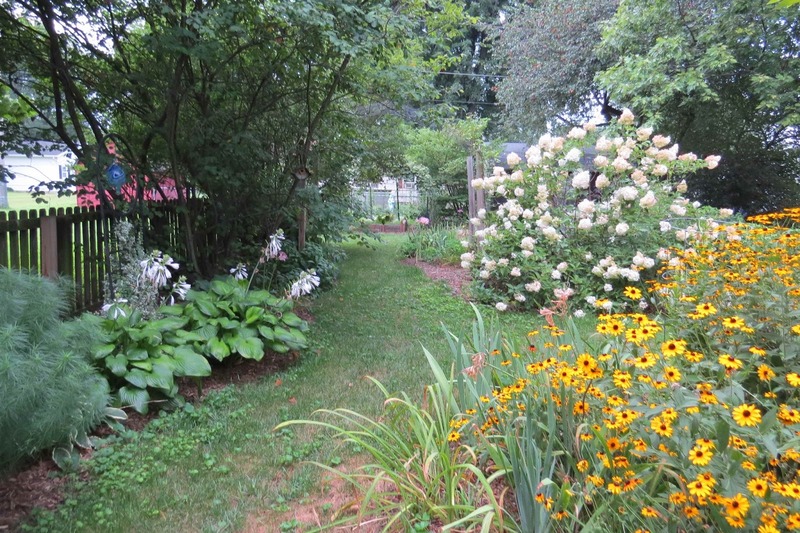 The Vanilla Strawberry Hydrangea, Rudbeckia and hostas are thrumming on. If you look really close you can see a few more colors. 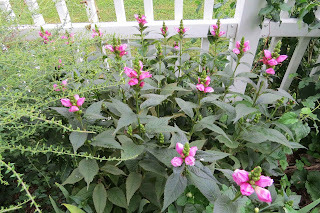 We have been so rain deficient that the holly hocks haven't grown tall nor have they many blooms on them. The poor monarda has absolutely flopped over. 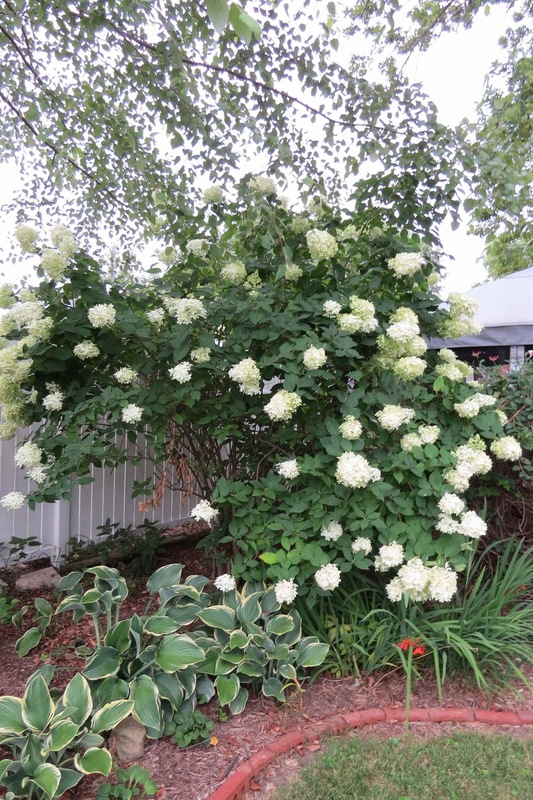 The Limelight Hydrangea scoffs at the drought. The turtlehead is another plant to consider if you need late summer early fall color. This is a hybrid 'Tiny Tortuga'. It doesn't get as tall as the straight species and isn't quite as aggressive but it can and does hold it's own in any weather. We have had lots of butterflies flitting through the garden. 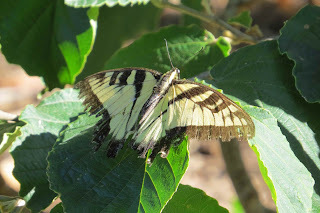 I think the only way I was able to get a shot of this Tiger Swallowtail is because it was worn to a frazzle and took a rest on a sunny Witch Hazel leaf. 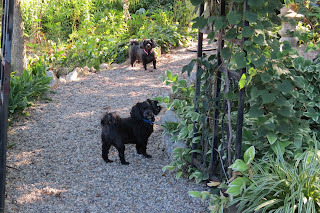 We herd the dogs to the park daily for a good walk. While there this week I spotted this HUGE fungus growing at the lower 2feet of this tree. It is huge as you can see with my hand being there to compare. I don't know what kind of fungus this is but it is a beauty. It also is in layers. If you know what this fungus is I would appreciate any information you can impart about it. 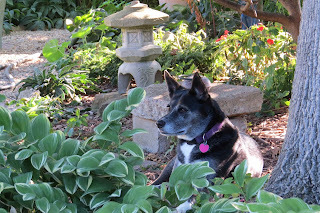 I hope you are enjoying the Dog Days and your garden is thriving not just surviving. 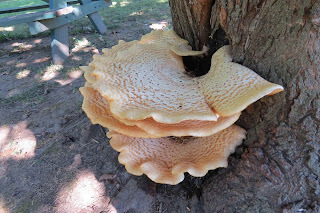 EDIT: I found out what kind of fungus this is, Dryad's Saddle. Hi Lisa, What a good doggie aunt! I hope they were fun. My garden is fading, as well. It happens at this time every year. I'm trying to introduce more color for this time of year but, nothing beats June and July! It maybe that there is so much garden eye candy those two months that I won't be satisfied with less! Nice pic of the Swallowtail. Seems like most perennials blooming now are some shade of yellow. We don't have dogs, so can we still have dog days? Of course you can have dog days. It is just that these furry beasts emphasize the fact that it is dog days. That shelf fungus is amazing! I love how cool fungi can be. 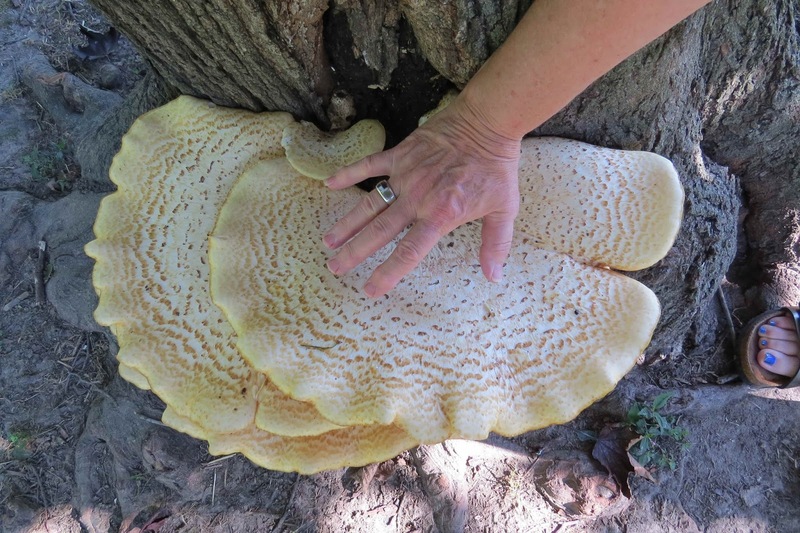 I am always agog when I find a really pretty and BIG one like this. I found out that it is Dryad's Saddle. Not sure of the scientific name, we always call those things "shelf" fungi or shelf mushrooms. Dryad's Saddle is one of the common names of this fungi. Some also call it Pheasant Back or Hawk's Wing. I watched a video of a Brit finding and eating this fungus. Common name Dryad's Saddle, Pheasant Back or Hawk's Wing. You have a beautiful garden Lisa. Hi Rose, I have down that it was 2010. So seven years ago. Doesn't seem that long ago does it? Yes, Sonny and Cher are cuties.It is their job to make us smile and they do a good job of it. Cool fungus! So weird that you are having a drought, and we (not so far away) are having excess rain. Even with the rain, my garden is going to the dogs lately, too. Or, maybe I should say...the chipmunks, the squirrels, the rabbits, the voles. LOL. It's really a mess, but I guess they're happy anyway. Cute doggies! It seems that this is the mantra of our summers now. Ihave never had to water like I have this summer. Thank you for the encouraging words. I didn't realize you were so dry out there. Hope you get some relief, although I have to say it doesn't show in the photos! Good luck with your dog days, they look like they're always up to something. Good thing Annie has her eye out for them! 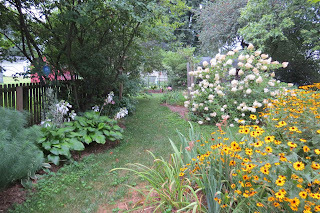 I tend to show the prettier parts of the garden not the dried up lying down shrubs and flowers. The watering has commenced. I hope I am not too late for some things. You must be having a lot of fun watching Sonny and Cher romp through your garden; they're adorable. Annie is a good sport to put up with them. Some great color in your garden despite the lack of rain! Dog days, indeed! I am longing for fall! Your garden looks very pretty, especially your rudbeckias. 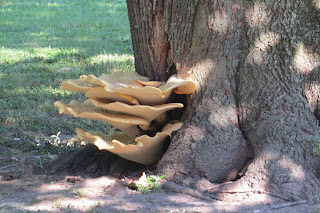 By the way, I just published a post on shelf fungus. I featured turkey tail fungus, but in my research I read that some shelf fungi live for years and continue to grow as they age. So that one has been there a while! I hope you've gotten some rain by now. Looks like some will be coming in. I like that word 'thrumming'!